"Thankyou" to everyone who come see us at WorldFest at Northgate Mall in Seattle! NOTICE: Advertiser's Deadline Extended to May 15th! NOTICE! 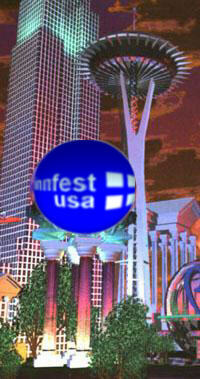 Welcome to Seattles FinnFest USA 99 homepage! This page is your source for information about FinnFest USA 99, the active Finnish community of the Pacific Northwest, and of Finland. Bookmark this site so that you can easily check back for frequent updates on FinnFest USA '99 as it unfolds. In addition, browse around and you'll discover a very comprehensive site with the latest information on FinnFest USA '99 and a variety of topics about Finland and Seattle -- from the worlds longest word to the best place to find a good latte in Seattle. Join us for a celebration of "Finnishness" in the prime of Seattles summer as Finns from around the world gather in Seattle for FinnFest USA 99. Sunny warm days are just about as certain as is rain in mid-winter. The flowers are in bloom, and "the Mountain is out" as we say. The beautiful University of Washington campus, with Mt. Rainier as a majestic back drop, will provide the surroundings for a memorable FinnFest that will be talked about for years to come. FinnFest USA 99 will truly have something for everyone. From young children to adults and seniors, we have activities for you! But in addition to all of that, there are plenty of things to see and do around Seattle and the greater Puget Sound region while you are here. So, plan to stay awhile! We are pleased to announce that the official program schedule has recently had its public debut. It will, however remain subject to change as we continue to add exciting events and activities. So keep checking back for the latest updates! And be sure to add this site to your favorites for easy and quick access because it is here to stay! After FinnFest, this site will serve as the Northwest Finns community web site. Stay tuned.